When I was a student in London in the mid 1960”s I went several times to visit the Iveagh Bequest at Kenwood House, a beautiful building on the outskirts of London. Kenwood was built in the 17th century and renovated in the third quarter of the 18th century by Robert Adam. It was acquired by Lord Iveagh, a member of the Guinness family of brewery fame, in 1925 and given to the nation when he died in in 1927 and opened to the public in 1928. The house has been temporarily closed for renovation including their leaky roof which seems to be endemic in rainy London. What surprises me is that I remember well the self-portrait of Rembrandt that has resided there for the last 90 years. So when I went to the Metropolitan Museum where it was briefly on loan it was like seeing a long lost friend. Unfortunately, in the meantime it has been glazed putting a very noticeable barrier between me and the intimate experience. It’s a little like an old flame showing up for dinner with a chaperone! Rembrandt painted over 40 self-portraits between the late 1620's and his death in 1669. This one dates late in his career from between 1663 and 1665. Self-portraits are a perfectly logical pursuit for an artist since he or she are always an available model. What I don't understand is that more artists don't seem to do it that often. I think that one of the things we like about Rembrandt today is the colourist aspects of his painting. 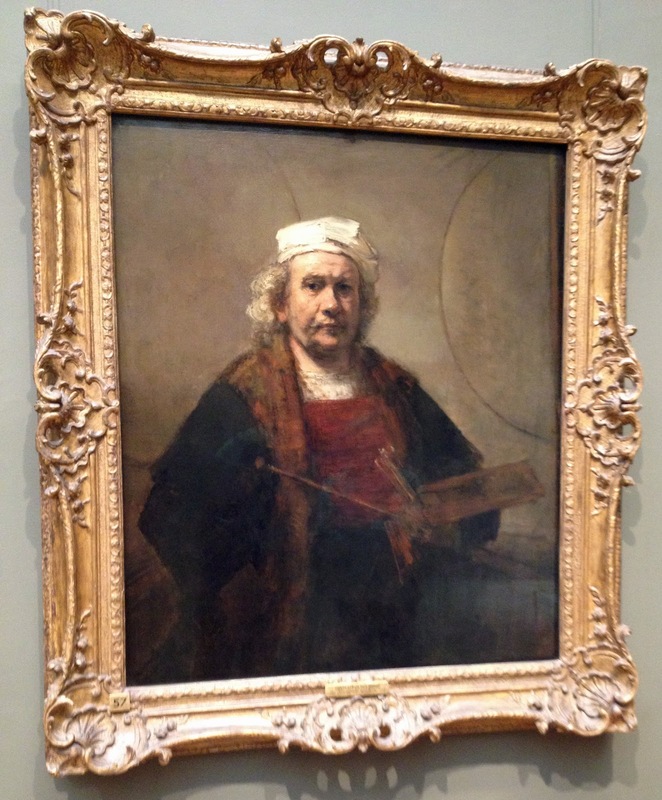 Though it was not much appreciated in its time as Rembrandt fell out of favor. As you know, Rembrandt always used a subdued pallet with tones of white for contrast, splashes of color gave certain passages special emphasis. Here we see a very prominent red shirt. Could it be that as people get older they are often more daring. Who wears those loud colored shirts and trousers? In the Met’s own self-portrait of the artist painted just a few years earlier the red shirt just peeks out from his jacket. A question that has been discussed is whether the natural aging process of the eyes and particularly cataracts which many people over 40 experience has an effect on an artist‘s work. Having gone through this experience, I am convinced that it has. Even the earlier Met self-portrait seems more precise. Perhaps I should mention here that I had my second lens implant a few weeks ago so that my eyesight did not get in the way of a direct experience with the picture. One of the most noticeable aspects of the lens replacement is that whites become white again. I have been joking after my first operation that if I looked at a painting with my left eye it needed cleaning and if I looked with my right it was miraculously cleaned... saves lots of money on conservation! I was glad to catch “my” Rembrandt which only made a brief guest appearance in New York before joining his mates in Houston for a much larger show of the Iveagh bequest which opens shortly. **An apology: In my blog regarding the Spring Show I forgot to credit Lawrence Steigrad Fine Arts as the owner of the wonderful Weenix painting of the hound.